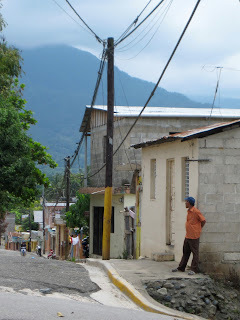 One of my favorite snapshots of our time in the Dominican Republic, this picture captures a lot of things for me: the peacefulness and reflectiveness of travel, the life of the rural Dominicans, the poverty that sneaks up on you as a traveler, waiting around corners and in between buildings, ready to expose itself when you least expect it. But most of all, this image captures a moment in time, a place I loved, and an adventure I won’t soon forget. 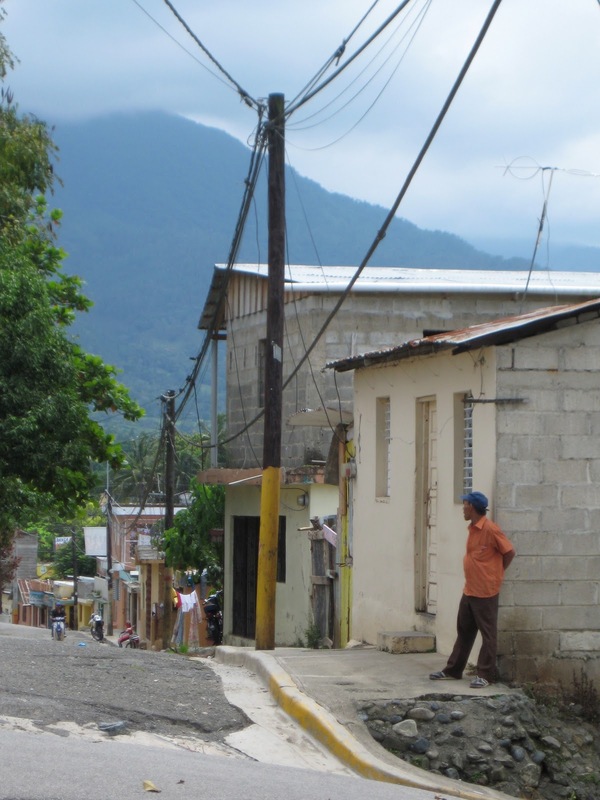 Jarabacoa, where the photo was taken, is a rural mountain town known for its crops: strawberries, coffee, and peppers, as well as its flowers. It’s a beautiful little place with a nonexistent nightlife, not much in the way of tourism, and definitely little to offer the spoiled traveler who came to the DR for the beaches and five-star resorts; but to us, it was a favorite spot, just a two-hour bus ride away. It’s also the place where some pretty crazy things happened: the bat that got stuck in our room and dive-bombed me while I was sitting in bed; the hour-long horse ride through the mud and muck of the jungle, during which my husband and friend complained most of the time (but I really enjoyed); the waterfall excursions and swimming in the pools below; drinking beer in el parque, pretending not to feel out of place as the only gringos there; eating at the same restaurant three times because we couldn’t find anywhere else; the final trip with a dear friend of mine in the DR, before we parted ways. These are the things I love about my travels to Jarabacoa, the things I’ll reminisce about for years to come. I call this my “explorer pose,” because I, well, was trying to look like a traveler/explorer. To me, this photo, while posed and a bit forced, shows a great deal about me as a person and how I changed in 2009. Case in point: Doug loves to tell the story of how, shortly after we started dating, I said something like, “Oh, yeah, I don’t stay in hotels less than four stars.” At the time, I think Doug just looked at me strangely, not wanting to offend his new girlfriend; later, he told me—and anyone else who would listen—how silly he thought I was for saying such a thing. (I admit, it was a bit silly.) 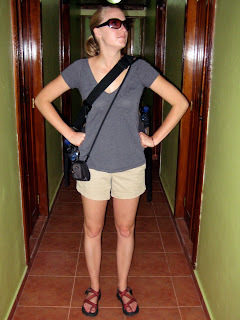 But just a little over a year after that statement, here I am, clad in my explorer outfit, living in a new-to-me third-world country, wearing Chacos and my Timbuk2 bag, ready to tackle some adventures. This is after riding a bumpy bus through winding mountain roads (which, I later learned, is a super deadly and dangerous road), checking into a MUCH less than four-star hotel, and eating some questionable food at a local joint across the street. Ah, yes, 2009: the year I became tough. As I look at these photos, I can’t help but wonder what the heck I’m doing now. If 2009 was the year I became tough, 2010 was the year I “went with it” by randomly moving to Asia, and 2011 was the year my career took off and my hard work was finally recognized, what will 2012 be? Well, for starters, it can be the year I realized a lifelong goal: writing a book. But what else? How will I grow personally, professionally, and spiritually? How will I find adventure when I’m stuck here in the U.S., not traveling, and not immersing myself in new cultures? Reaching a lifelong goal isn’t enough for me this year; I need to do something big, to keep up with the tradition of years past. But, really, you can’t plan these things. All you can do is take the opportunities life offers, go with the flow, and try to enjoy it.